Coinspeaker partnered with ICOBox to provide our readers with this weekly analysis conducted by Professor Dima Kornilov and Dima Zaitsev devoted to cryptocurrency and digital assets markets changes that took place in February 2018, including over the last month (February 2018). This report presents data on the cryptocurrency market changes during 2017-2018. 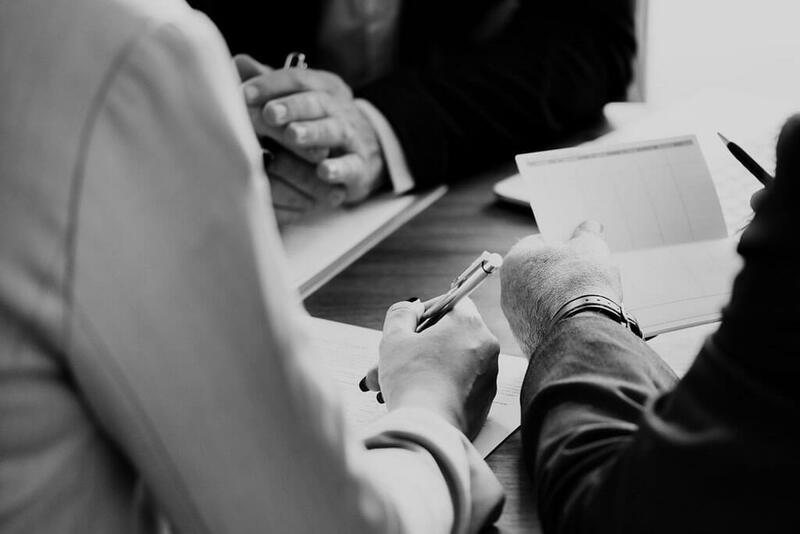 Special emphasis has been placed on an analysis of the changes that took place in February 2018, including over the last week (February 26-March 4, 2018). *** When calculating the ZAK-8 index, the cryptocurrencies with the largest capitalization are used. At present (March 4, 2018), the cryptocurrencies Bitcoin, Ethereum, Ripple, Bitcoin Cash, Cardano, Litecoin, Stellar, and NEO are used. 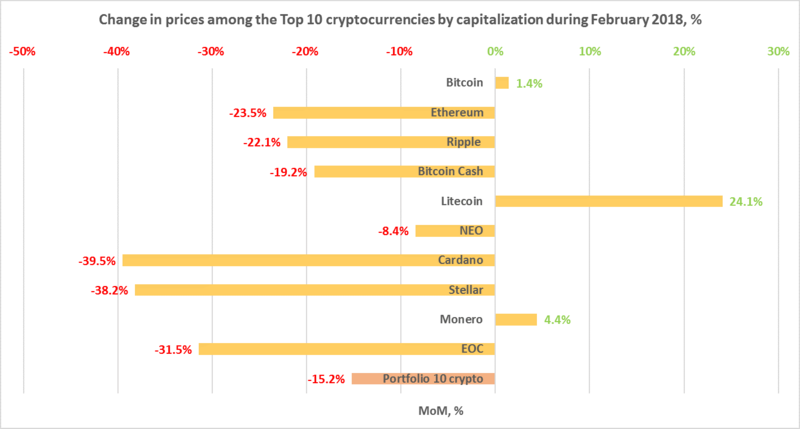 During February cryptocurrency market capitalization fell by approximately 15%, from $517.2 billion to $440 billion (see Table 1.1, as of 03:00 UTC). This was associated with the recovery of markets after a significant drop on February 6, 2018 (You will recall that the reason for the sharp fall in early February was a plummet in stock indexes (DJIA, S&P 500 Index, Nasdaq Composite, Nikkei 225, and a number of others), which decreased from February 6-10, 2018. The price of oil also fell). The Smith + Crown Index for the month decreased slightly from 24,709 to 24,051. The dominance of the four and eight largest cryptocurrencies as of 03:00 UTC on March 4, 2018, equaled 72.3% and 79.6%, respectively, with bitcoin dominance increasing to 41.9% (see Table 1.1). Overall, during the period from February 26-March 4, 2018, the price of 282 of the top 500 cryptocurrencies and digital assets appreciated, resulting in a growth in cryptocurrency market capitalization by approximately $25 billion. Over the past week the number of cryptocurrencies with a capitalization of more than $1 billion increased from 24 to 25, with the price of ten of them (DigixDAO, Monero, TRON, Nano, Bitcoin, Bitcoin Cash, OmiseGO, Dash, Ethereum, NEO) climbing during this period, which is related to overall market trends. The coins and tokens from the top 100 that demonstrated the largest growth in prices are given in fig. 2. Below we consider the top 10 cryptocurrencies that demonstrated the most significant change in price over the past week (fig. 2-3). In this regard, only those coins and tokens included in the top 100 in terms of market capitalization (according to the data of coinmarketcap.com) were considered. The change in price was calculated based on average daily data. Tables 1.2 and 1.3 show the possible factors or events that could have influenced the fluctuation in prices for certain cryptocurrencies. Table 1.4 shows the possible factors or events that could have influenced the cryptocurrency market in general. 1 Ethos ETHOS 54.37% $4.99 0.38 Ethos announced the release of the alpha version of its platform (https://twitter.com/Ethos_io/status/969240870569611265), thereby touching off price growth of more than 50% over the week and claiming first place among the biggest gainers among the top 100 coins by capitalization. 2 DigixDAO DGD 48.66% $522.20 1.04 On February 27 DigixDao spoke at the National University of Singapore (https://medium.com/@Digix/digix-dev-update-27th-feb-2018-uat-ux-specialist-national-university-of-singapore-talk-3f8a69eac1a4), relating all the news on the project, which may potentially have spurred the market to growth, as it was on February 27 that the coin’s price began to rise. 3 Cryptonex CNX 44.48% $7.65 0.35 The price of the coin has remained fairly stable for several weeks at around $7.50-$8, after a jump at the start of the week caused by the announcement on the project’s official Twitter account of the start of development of its own wallet (https://twitter.com/Cryptonex_CNX/status/968118795373105153). 4 Iconomi ICN 38.73% $1.98 0.20 On February 28, Iconomi was mentioned on the popular website livebitcoinnews, where this coin was included among six promising coins recommended for purchase. 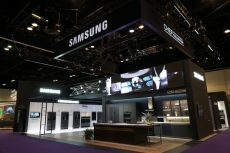 This article contributed to the price growth at the very beginning of March (http://www.livebitcoinnews.com/six-hot-altcoins-portfolio-year/). 5 Golem GNT 31.72% $0.422622 0.35 Golem also had some good news this week. The project announced the launch of a new alpha version of its platform (https://twitter.com/golemproject/status/969238473189330944). 6 Particl PART 29.68% $28.66 0.25 The start of the month was good for this coin, beginning with the news on the upgrade of its website (https://twitter.com/ParticlProject/status/969635463165300738). 7 Monero XMR 26.23% $346.91 5.48 The MoneroV (XMV) hard fork, which is designed to resolve the scalability problem of the original blockchain, is scheduled for March 14 on the Monero (XMR) network. In this regard, the opportunity for XMR holders to receive 10 new XMV coins looks fairly attractive (see below). 8 Blocknet BLOCK 21.22% $36.20 0.18 No potentially significant events were announced in relation to the remaining coins, and the range of movement in their prices can be explained by market volatility and trends. Blocknet, for example, may have grown on the strength of rumors on the upcoming release of the platform’s trial version. Factom is focused on expanding the ability of blockchain to store and process information using sidechains.Bytom is a fairly interesting interactive protocol of multiple byte assets. The project is aimed at converting physical assets into digital assets. There are two byte-assets inside the Bytom project: heterogeneous byte-assets (indigenous digital currency, digital assets) that operate in different forms on the Bytom Blockchain, and atomic assets (warrants, securities, dividends, bonds, etc.). BTM tokens and other currency are stored in the project’s own Bytom wallet. A depreciation in price was seen for 218 coins and tokens of the top 500 cryptocurrencies and digital assets by capitalization over the past week. Fifty-six of the top 100 coins and tokens dropped in price. The ten cryptocurrencies that showed the most significant drops in price are shown in fig. 3. 1 Polymath POLY -30.64% $2.30 0.21 Polymath is a platform that allows securities to immigrate to blockchain. Since an SEC investigation into several projects has started and the overall situation surrounding projects related to securities is starting to heat up, Polymath has been steadily falling in price. After surges in its price in the beginning and middle of February, Revain has continued its negative trend, which might serve as confirmation of the opinion that its price was previously overstated. Bitcore positions itself as new, improved coin for payments. 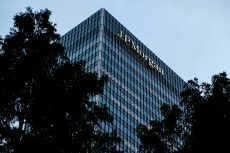 However, its main competitor, Bitcoin, is growing and has strengthened its position even further over the past few weeks, with its dominance increasing as a result of the reduction in transaction fees. All of this could cause a weakening of bitcore’s position. Ethereum Classic continued its negative trend, which started on February 24, after several weeks of intense growth in the coin price at rates that outstripped average market rates on the back of news on the Callisto hard fork. The hard fork took place on March 5, and the new coin with the ticker symbol CLO was available to ETC holders at a rate of 1:1. The price changes of all other coins were not out of the ordinary for the cryptocurrency market and can be explained by market volatility. Table 1.4 shows events that took place from February 26-March 4, 2018, and had an impact on both the prices of the dominant cryptocurrencies and the market in general, with an indication of their nature and type of impact. To analyze trading activity on cryptocurrency exchanges, the ZAK-n Crypto index is calculated (see the Glossary). The values of the ZAK-4 Crypto and ZAK-8 Crypto indices are presented in Tables 1.1, 1.5.a, and 1.5.b. For example, on February 6, 2018, the 24-hour trading volumes (Volume 24h) for the four dominant cryptocurrencies (Bitcoin, Ethereum, Bitcoin Cash, Ripple) exceeded $23 billion (Table 1.5.a). The value of the ZAK-4 Crypto equaled 10.3%, which attests to the extremely high liquidity and market dynamism of the dominant cryptocurrencies. The value of the index increased during the downturn on the cryptocurrency market (February 6, 2018), i.e. the daily turnover of cryptocurrencies exceeded 10% of their market capitalization. The 24-hour trading volumes (Volume 24h) for the eight dominant cryptocurrencies (Bitcoin, Ethereum, Bitcoin Cash, Ripple, Litecoin, Stellar, NEO, and Cardano) fell to $9.9 billion by the end of last week (Table 1.5.b), i.e. a mere 2.7% of their market capitalization. The ZAK-4 Crypto and ZAK-8 Crypto indices are considered in more detail in Tables 1.5.a and 1.5.b. The range of the fluctuations in the Top 10 cryptocurrencies in terms of capitalization over the past month equaled more than 50% (see Table 1.6). Litecoin showed especially large fluctuations, from $105.35 to $253.9. Thus, from February 1 to March 1, 2018, the ten leading cryptocurrencies by capitalization showed price changes ranging from -39.5% to +24.1% (fig. 4). An extraordinarily high correlation was seen between the prices of Cardano and Stellar (a correlation rate of more than 0.9 over the last two months). The average portfolio yield for February (Portfolio 10 crypto, consisting of the Top 10 cryptocurrencies in equal shares) was negative and equaled -15.2%. Since the beginning of February, total cryptocurrency market capitalization has fallen by 15%, from $517 billion to $440 billion at the end of the day on February 28 (https://coinmarketcap.com/charts/). This was a volatile month for the market, with the fluctuation in capitalization reaching minus 47% for a week, when total capitalization fell to $277 billion on February 6. After a very poor first week of February, the market started to show a moderate positive trend and reached the level of the beginning of month on February 18. However, by the end of the month total capitalization had still fallen by 15%. Most of the coins from the top 10 in terms of capitalization fluctuated in line with market volatility, and adhered to the overall negative trend on the cryptocurrency market. However, the Bitcoin price ultimately even increased by 1.4% during February, while the price of the majority of altcoins from the top 10 fell by more than 15%, with the exception of Litecoin and Monero (fig. 4, Table 1.6). Bitcoin set the tone for the market in the first half of the month, with altcoins mimicking its movement, and bitcoin dominance hovering around 35%. However, bitcoin began to show better than average market growth after February 15, and altcoin growth was unable to keep up, leading to bitcoin holding 40% of the market by the end of the month. 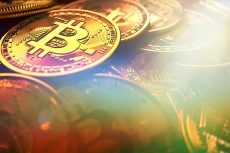 After February 6, which was a lamentable day for the entire market, this bitcoin recovery, which outperformed market trends, was caused to a large extent by the significant fall in transfer fees within the bitcoin network due to the ever more prevalent use by major players of new technologies for better scalability. For example, on February 20 Coinbase and Bitfinex announced the integration of SegWit. February turned out to be much more successful for Litecoin than for the other coins from the top 10, with this coin managing to demonstrate +24.1% growth despite negative market trends. This can largely be explained by one day, February 14, when the Litecoin price increased by more than 35%. By the end of the day on February 15 it was trading at around $215 and stayed there for the rest of the month. This leap was the result of the announcement on February 13 of the new Litepay payments infrastructure for Litecoin. There were no major undeniably positive events regarding Monero in February, except for several small favorable announcements of new partners accepting Monero, such as, for example, this jewelry company. That being said, the MoneroV (XMV) hard fork is scheduled for March 14 in the Monero (XMR) network. This hard fork is intended to resolve the scalability problem of the original blockchain. In this regard, the opportunity for XMR holders to receive 10 new XMV coins looks fairly attractive. It should be noted that at present there are 15,786,831 XMR coins in circulation, while the total issue of MoneroV (XMV) will equal 256 million coins. The largest falls among the top 10 coins in terms of capitalization this month were seen for Cardano (-39.5%), Stellar (-38.2%), and EOS (-31.5%). Cardano had a very hard time recovering after the market plunge on February 6, and was unable to begin a positive trend. The trading volumes are still relatively low compared to the start of the month, pointing to a total loss of interest of market participants in this coin. The Stellar price also mimicked market movements, and lost the interest of market players in the second half of February. By the end of the month, 24-hour trading volumes ranged from $35-45 million, which is very small for a coin with a capitalization of $6 billion at the end of February. The other coins from the top 10 (Ethereum, Ripple, Bitcoin Cash, and NEO) also repeated the negative market trends caused by the continuing adjustment and negative news items, such as, for example, China blocking access to all foreign cryptoexchanges on February 6. 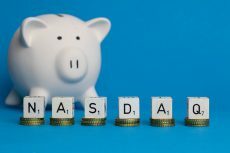 Nevertheless, NEO showed somewhat better indicators, falling by only 8% over the month, due to the major positive news that the Weiss rating agency had assigned an A rating to the NEO cryptocurrency on February 26, triggering a growth of 15%. We remind you that this was the first time that an A rating had ever been assigned to cryptocurrencies. The airdrop of Ontology tokens among NEO token holders also undoubtedly had a positive effect on the price of NEO. The free distribution to NEO holders of the Ontology (ONT) tokens at a rate of 0.2 ONT for every NEO was planned after March 1 (granted, the ability to dispose of 50% of the Ontology tokens will be “frozen”, due to a temporary block). Table 1.7 gives a list of events, information on which appeared last week, which could impact both the prices of specific cryptocurrencies and the market in general. The weekly cryptocurrency and digital asset market trends from October 1, 2017, to March 4, 2018, are presented as graphs (Fig. 1.1-1.5)*. Total cryptocurrency market capitalization, USD million Fig. 1.1 This figure shows cryptocurrency and digital asset market capitalization trends from October 1, 2017. The rate of market change (as a % to the beginning of 2017) Fig. 1.1 This figure shows the % change in cryptocurrency and digital asset market capitalization compared to January 1, 2017. Change in the market capitalization (in USD million compared to previous period) Fig. 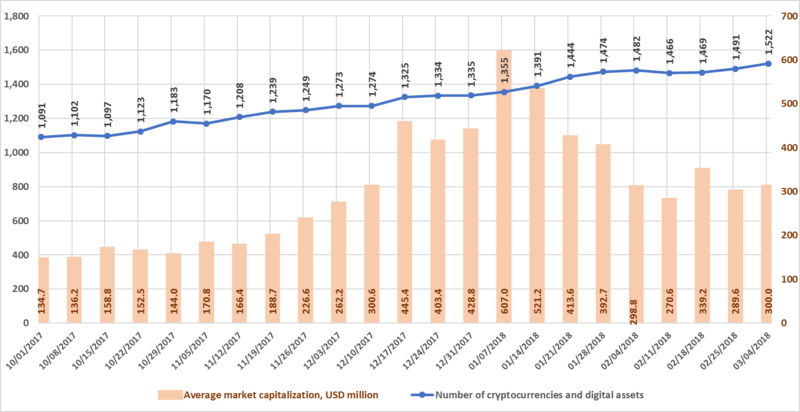 1.2 This figure shows the weekly change in USD million (increase or decrease) in cryptocurrency and digital asset market capitalization from October 1, 2017. The rate of market change (as a % compared to the previous period) Fig. 1.2 This figure shows the % of weekly change (increase or decrease) in cryptocurrency and digital asset market capitalization from October 1, 2017. Number of cryptocurrencies and digital assets Fig.1.3 This figure shows the trends in the increase of the number of cryptocurrencies and digital assets circulating on cryptocurrency exchanges. On January 1, 2017, their number was 617, and as of March 4, 2018, this number had already reached 1,522. Average market capitalization, USD million Fig. 1.3 This figure reflects the growth in the average cryptocurrency and digital asset market capitalization from October 1, 2017, i.e. the ratio between the market capitalization of all cryptocurrencies and digital assets and their number. ** NB! Average daily data are given in the graphs below. For this reason, the figures in the graphs may differ from the data in Table 1.1, where all figures were calculated at 03:00 UTC. * Average daily data (according to the data of coinmarketcap.com). Figure 1.1 shows a graph of the weekly cryptocurrency market change from October 1, 2017, to March 4, 2018. Over this period, market capitalization increased from $146.9 billion to $456.6 billion, and a growth of 2,479% relative to the start of 2017. Over the past week (February 26-March 4, 2018), capitalization increased from $431.9 billion to $456.6 billion (as of March 4, 2018, based on the average figures from coinmarketcap.com). The market is susceptible to sudden and drastic fluctuations. The highest growth rate in Q4 2017 (December 17-24, 2017) was around $200 billion, or 54%. During the first week of January, market capitalization increased by approximately $250 billion, or 44%. Last week the market increased by $24.7 billion, or 6% (with due account of average daily data, see fig. 1.2). Since the beginning of October 2017, the total number of cryptocurrencies and digital assets considered when calculating market capitalization has increased from 1,091 to 1,522. Over the last week, the number of cryptocurrencies and digital assets increased by 31, from 1,491 to 1,522. 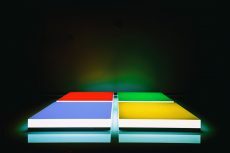 That being said, their average capitalization increased from $289.6 million to $300 million. Over the past month, 55 new coins and tokens have appeared on coinmarketcap.com, but it should be noted that a number of other coins and tokens were also excluded from the list. From the middle of January and throughout February the market was susceptible to sharp drops and gradual recovery. Capitalization is currently ¾ (three-fourths) of the value of cryptocurrencies at the beginning of 2018. The middle of January and February demonstrated the extremely high correlation between the prices of most of the Top 100 cryptocurrencies and total cryptocurrency market capitalization during a period of downward adjustment. Bitcoin’s gradual recovery of its position should be noted. Its dominance has begun to grow, and exceeds 40%. You will recall that its dominance fell abruptly, by nearly half to 33%, in the second week of January, i.e. Bitcoin was the harbinger of the subsequent serious downward adjustment of the entire market. Most cryptocurrencies follow its lead, with a certain lag time. Therefore, one can conclude that the growth in Bitcoin will serve as an impetus for the recovery of other cryptocurrencies. The Glossary is given in the Annex.